The V-Max Elite 7580V-601 air compressor combines leading-edge technology with the superior build quality you've come to expect from the world leader in automotive service equipment. 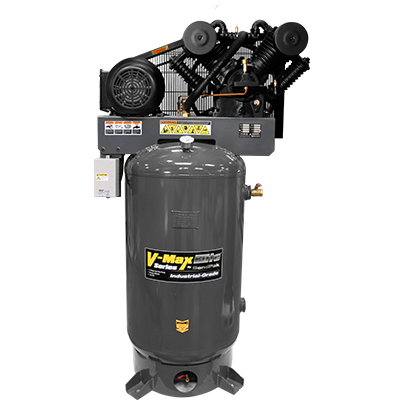 Unlock your shop's full potential with the V-Max Elite 7580V-601 Air Compressor. Featuring the rugged V-Max extreme-duty, four-cylinder pump design, the 7580V-601 is engineered to operate at maximum efficiency under all load conditions. This rugged, two-stage, lubricated reciprocating air compressor with 100% cast-iron pumps will provide the quality and performance required for every air-intensive application—from automotive and body repair to manufacturing and industrial service. This air compressor includes a set of four rugged, half-inch thick pads to ensure there's virtually zero machine vibration during operation. The high-quality elastomer compound resists aging, compression set, water and oil. V-Max Elite air compressors like the 7580V-601 enjoy massive energy-efficient pumps that run at considerably slower speeds, resulting in lower operating temperature and maximum compressor efficiency. This is key. When making an air compressor purchase, you should always ​figure the power consumption and maintenance cost into the overall price of the unit to determine the true cost of ownership. Electric power costs can add up considerably, based on the horsepower required to produce the necessary air. Producing more air per horsepower is exactly what the V-Max Elite 7580V-601 is designed to do. It won't take long for you to realize how well the 7580V-601​, or any V-Max Elite compressor​, stacks up against the competition. Bottom line: BendPak V-Max Elite air compressors produce more air per horsepower in a shorter amount of time. Nothing else comes close to ​their value.